Anju Modi showcased her latest bridal collection at ICW 2017 and we’re simply loving all the lehenga inspiration. Titled ‘Sunehri Kothi’, the collection was inspired by 16th century Rajasthan. Focusing on miniature Rajasthani art from that era, Anju Modi used a colour palette of pastel and bright colours with the occasional pop of rich blue and red. Dia Mirza looked like Rajasthani royalty in a deep-toned lehenga with rich ruby and emerald hues. The velvet blouse with silver embroidery complimented beautifully complimented her jewellery. The ensembles were all dual-coloured or more, with detailed zardozi embroidery that wasn’t too heavy - and not too minimal either. The silhouettes used were all more or less traditional with a very slight fusion of contemporary ethnic on some garments. 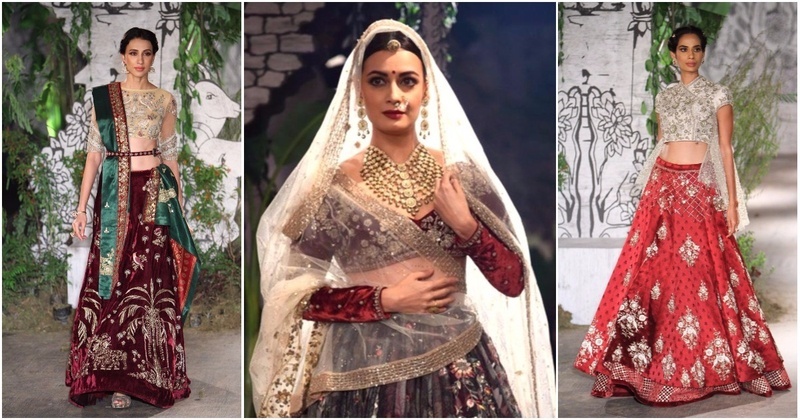 Check them out for your daily dose of bridal lehenga inspo!